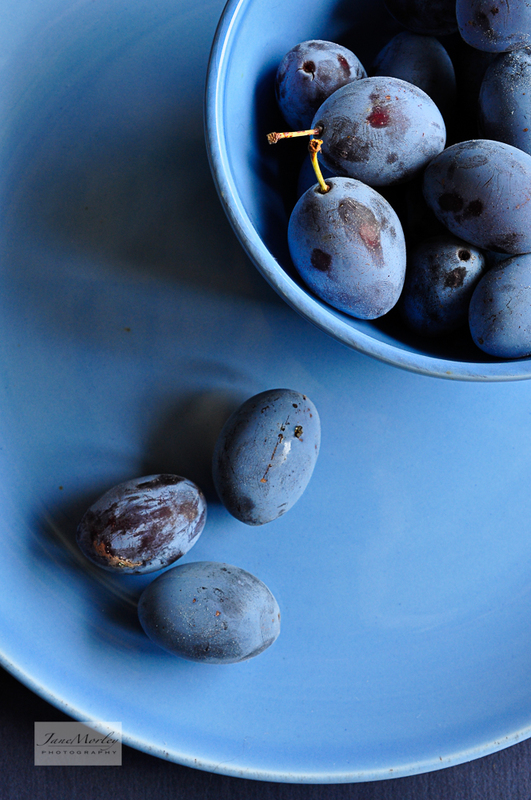 I’ve been wanting to finish my marathon fruit photography series with the wonderful damsons we’ve just picked from the orchard. 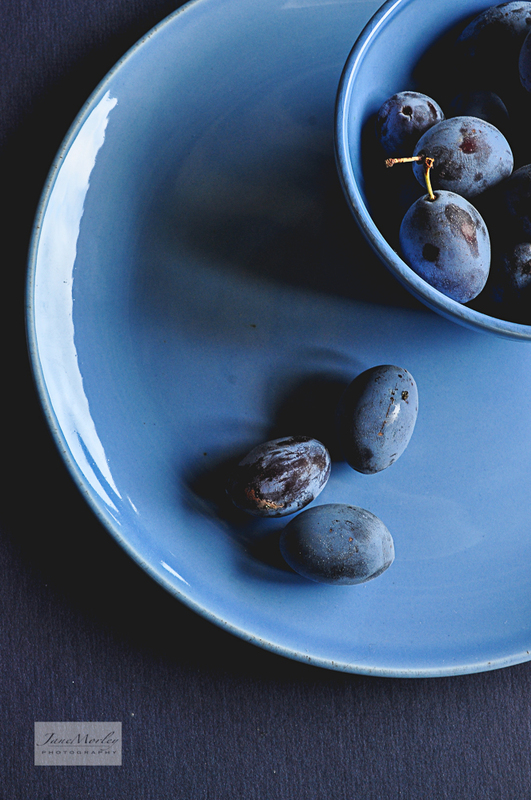 The colour of the bloom on the fruit is so blue and beautiful I’ve been wondering how best to capture it and had finally decided my plain blue crockery would be the perfect compliment. I took my subjects out to my favourite spot in the shelter of the covered courtyard to get the full benefit of the natural light, placed them on some blue card and couldn’t believe the richness of the resulting images. The intensity of the colour is astonishing and changes from rich powder blue to purple tinged royal blue depending upon the angle of the camera. You may not believe it but none of the photos have had the colour saturated – I never like to edit too much, just a little sharpening and light adjustment here and there (the final image of this series is shown unedited). 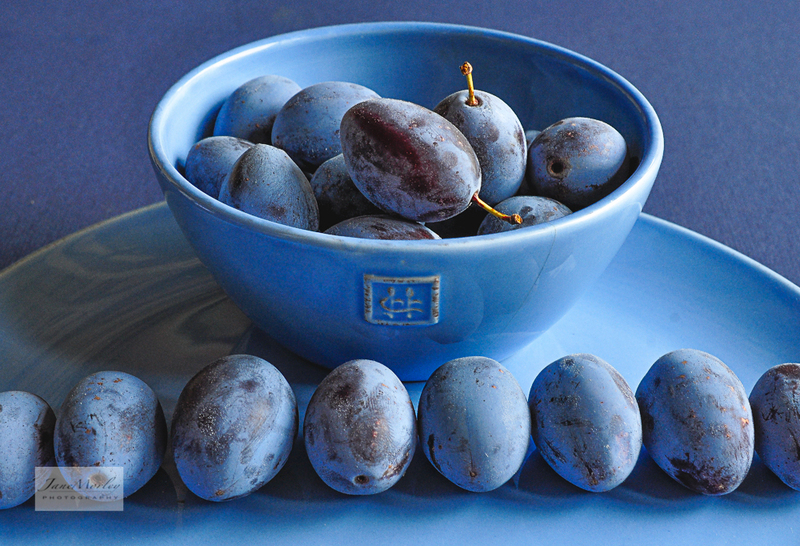 I was delighted to see that the WordPress Weekly Photo Challenge subject for this week is Monochromatic, my beautiful blue plums will be my contribution – a luscious Rhapsody in Blue….. Incredible. Stunning. Scrumptious. These are fantastic! Cheers Julie – I really appreciate that! Jane this is amazing!!! I absolutley love thise blues!! 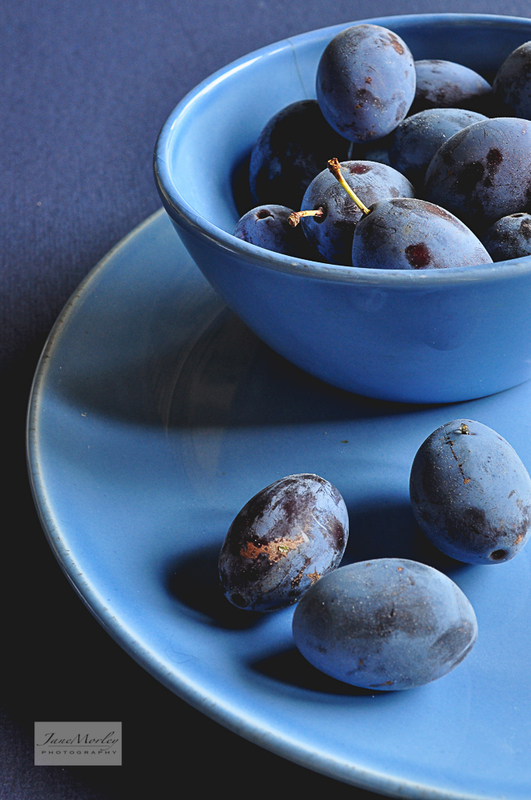 Yum, love the damsons plums. Many thanks indeed astep479 ! You are a sweetheart Sarah – Thank you! Many thanks Northumbrianlight- much appreciated ! Cheers Timothy! Glad you like it! Bountiful of beautiful fruits – fantastic and beautiful work. Thank you cattan2011 for your very kind comments – much appreciated! Thanks Kaz – so pleased that you like it – I’m a big fan of blue! 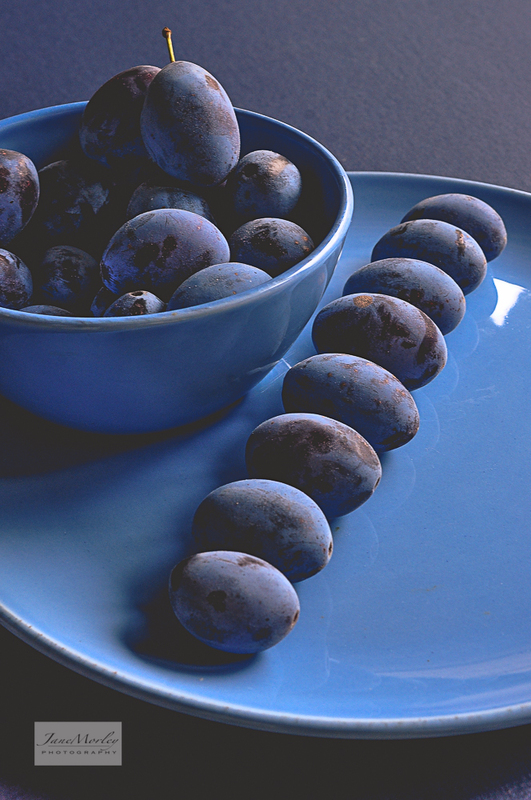 Very nice still life arrangements. Cheers Jodi – much appreciated! Marvelous blues. 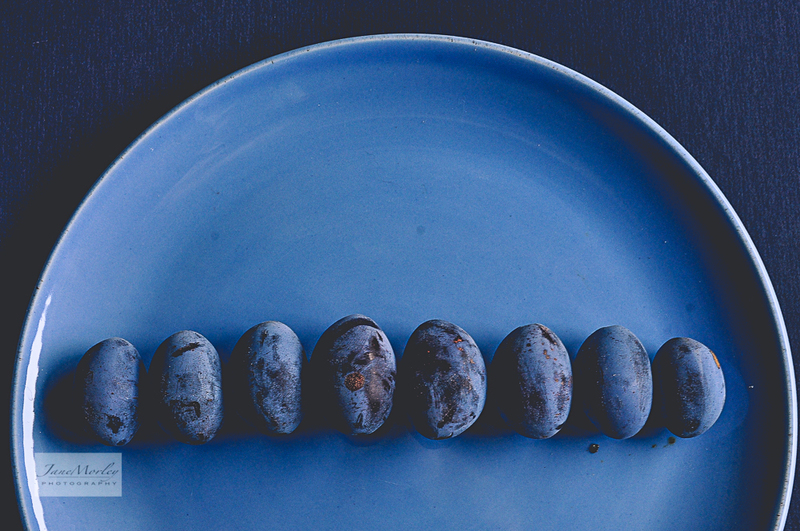 I love the orderly vs. the random…beautiful set, Jane. Thank you Jane, glad you like the contrast I had a bit of fun arranging them!! Thank you idelhomemaker! So glad you like them! Thank you Sylvain – you’re very kind! I’ll have a look at the challenge and thanks for inviting me! Great photos, and appropriate caption! Thankyou very much indeed marlandphotos – much appreciated! Great series of photos. Marvelous photography and great idea. Thank you so much Cee – very much appreciated! A perfectly delightful choice, Jane. Thankyou! I hope you like the rest of it! Exquisite photos. Beautiful blown up on a kitchen wall. Thank you very much beeblu – funny you should say that …….just about to do the very thing! wow the blues you achieved are so rich and luminous…kudos. Thank you frenchapple! So glad you like it! So stunningly simple and so absolutely beautiful, Jane! Love these images!! Thanks Stacy – much appreciated!